When you are in transition and your breakthrough is getting close, you can tell because you’re not your usual self. You get easily aggravated. You may feel helpless. Things that never use to irritate you will and people who never mattered to you matter. Don’t let it discourage you. God is shifting you. When it seems like you are at your worst, God sends a miracle. A ram in the bush with provision. Praise and worship God. Keep your mind stayed on Jesus. Before you could get to where God was taking you some things had to change. You couldn’t get to where you are by staying the same person. 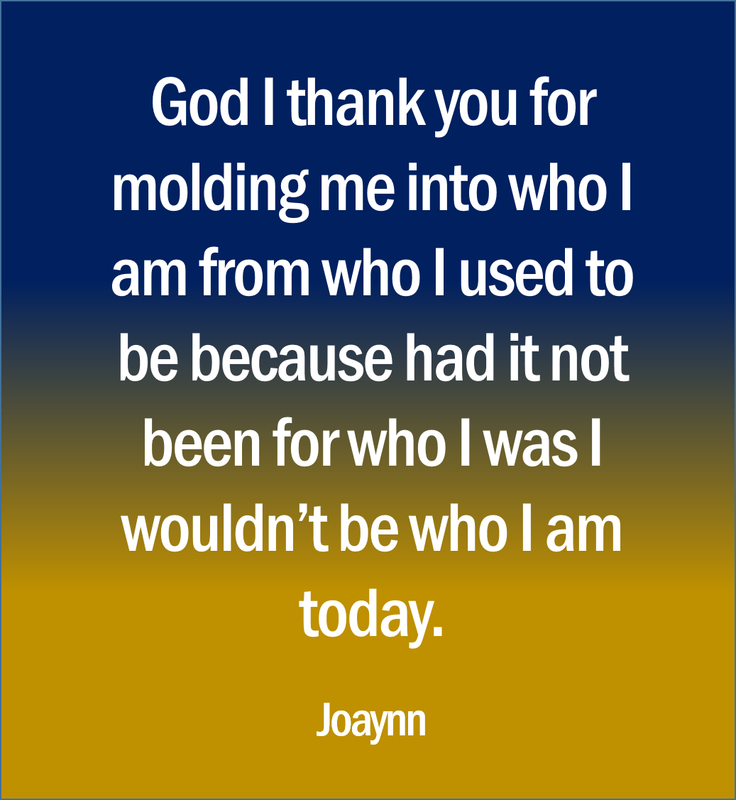 Thank God for molding you into the person you now are from who you used to be. You couldn’t remain the same person. God shaped you to prepare you for your destiny. Say this with me, God I thank you for molding me into who I am from who I used to be because had it not been for who I was I wouldn’t be who I am today. Hello Fear, Let Me Introduce Myself. 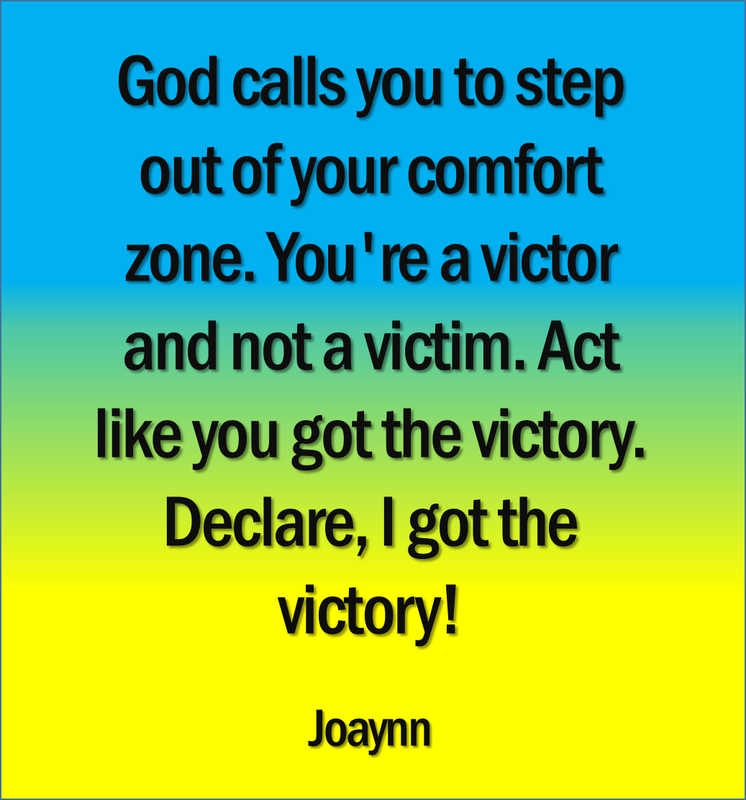 My Name Is Victory But I Go By Faith. I’m Fearless. Nice To Meet You! To my old friend Fear, sorry I sent you away. I could no longer live afraid every day. I had to take a stand. I couldn’t keep myself bound. Always fearing what would happen every time something in my life changed. I had to let you go so I could move forward. And not be afraid to live a better life God promised would be rewarding. There was a time in my life when I couldn’t sleep at night worrying about any and everything. I couldn’t rest. I was so tired from so many sleepless nights and kept wishing one day it would end. Oftentimes I blamed myself because I was so busy trying to figure things out on my own. Only to find when I did, I failed miserably at it. I sought God only after I made a total mess of things. I knew God but my faith was fair-weathered and flaky. It fluctuated depending on how things would go in my life. If everything worked out as I thought it should, my faith was enormous. But when things didn’t work out in my favor, my faith went out the window. As I got older and found myself yearning for a deeper and closer relationship with God, I noticed how some things began to change in my life. I found myself studying and meditating more on God’s Word. I learned I didn’t need to pray outlandish prayers for God to hear me. I learned how to simply pray and thank God in everything, no matter how big or small. My faith in God grew stronger. One day when my faith was greatly tested, I decided to use the strength God gave me and turned fear into faith. I had to release fear that day. I sat in darkness and sang out loud to myself, Fear, fear go away. Sorry, you can’t come back another day. One day I will happily report with praise I found a new friend. What a friend I have in Jesus! It took me some time to learn this but I thought of and keep reminding myself daily of this: Fear paralyzes. God promotes. Don’t be crippled by your circumstances. Get out the boat. Your steps are ordered by the Lord. Walk by faith and not by sight. I am no longer afraid of the dark. I have a new faith walk. I reintroduced myself to fear with my new name. I said this to him: Hello Fear! Let me introduce myself. 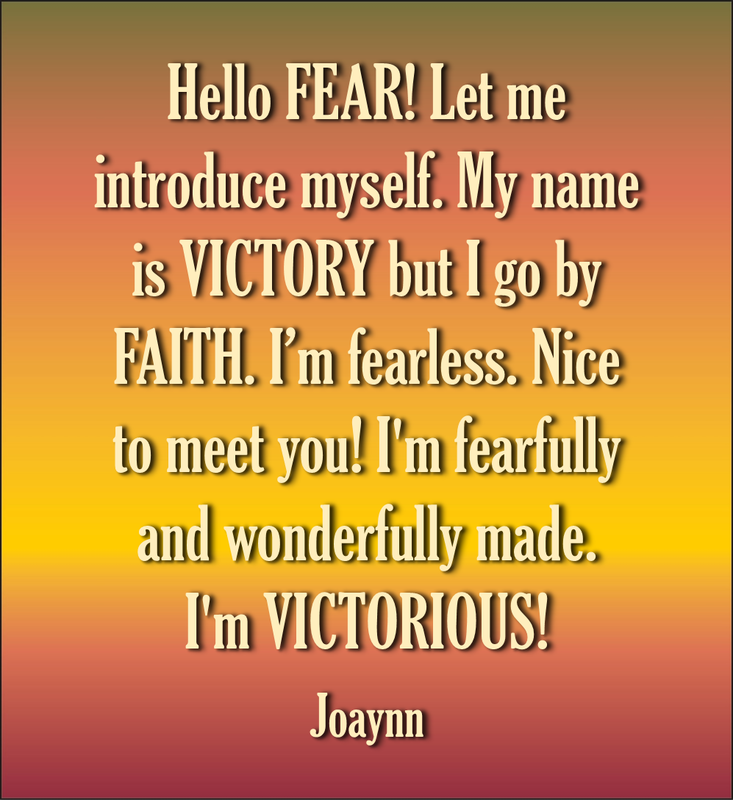 My name is VICTORY but I go by FAITH. I’m fearless. Nice to meet you! I’m fearfully and wonderfully made. I am VICTORIOUS! Take it from me, when nothing makes sense have no fear. Activate your faith. Operate like it’s already done. Believe God for supernatural blessings. Thank you Lord for loving me even when I fail you. I love you. The greater our burdens, you give us more grace. Thank you for your saving grace. Thank you for loving me. I’m amazed by the depth of your love for me. It is as wide as the ocean, deep as the sea. It is a never ending story. Your love is steadfast and never fails. It is everlasting. Thank you Jesus. Lord you are good. Your mercy endures forever. I’m grateful. Let me decrease; let You increase that I may bring You glory. As I walk with you, let my light shine so bright that when people see me, they see Jesus in me. I just want to take a moment not to ask for anything and thank you for everything. Thank you God. Your grace kept us. We’re still standing. You woke us in our right minds. You started us on our way. 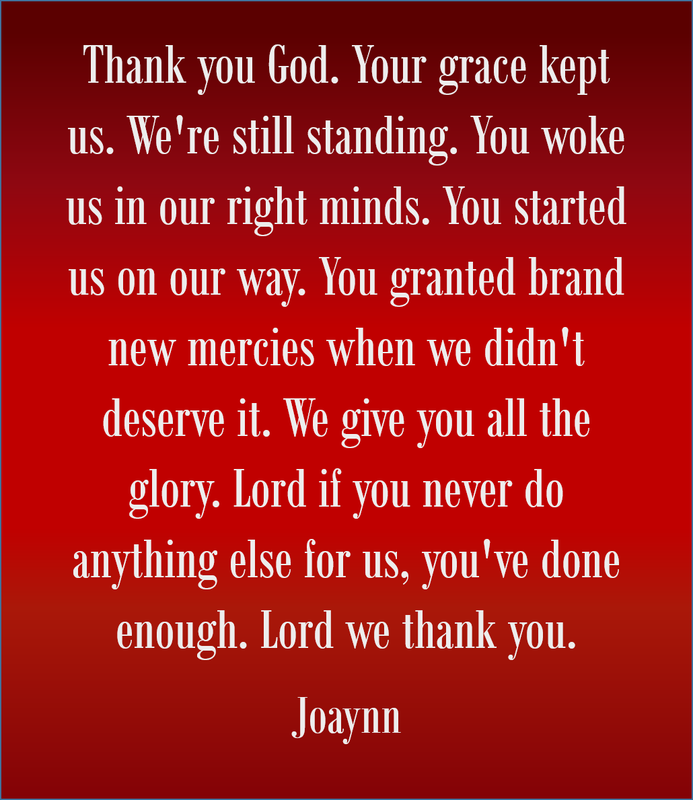 You granted brand new mercies when we didn’t deserve it. We give you all the glory. Lord if you never do anything else for us, you’ve done enough. Lord we thank you. Consider Trouble A Blessing And Not A Curse. God Is Preparing You For Your Future. Declare, I’m Walking In My Destiny. I Got The Victory! When you go through the unspeakable you will find out who your true friends are. You will know who God is and learn who you truly are. See, before storms in life present itself to us we have an idea of what we are made of. But when the storm comes, we cannot imagine who we may become. We may rely on people to approve, accept, and acknowledge us believing this is what we need to become who we will be. However, none of it is necessary. When going through the trial and our faith is tested, we learn about ourselves. God shows us who he is. We may never understand the season we’re in but we learn of God’s power and sovereignty while in it. He is preparing us for what he already knows; our future. He’s pruning, refining, shaping us for what’s to come. Be grateful. Adversity reveals character. Trials make us stronger. Thank God for the trials and the people who left you. Everybody can’t go with you. No matter what season you may find yourself in, God is all you need. He approves of you. Believe. Comments Off on Consider Trouble A Blessing And Not A Curse. God Is Preparing You For Your Future. Declare, I’m Walking In My Destiny. I Got The Victory! As believers we are representatives of God and are responsible only to God. God holds us accountable for our actions. We cannot do this thing called life on our own without him. Recognize your limitations. Admit when you need him. Oftentimes when situations occur that are out of our control we tend to place God in a box and will question his ability to handle things beyond our control. When things are not going as well as we expect, we run down the streets and around the corners looking for him. Forgetting he’s always in our neighborhood. He is omnipresent. He is everywhere. We may not be able to trace him. Trust him. To think God does not know or even cares about situations in our lives is to make the mistake of placing limits and restrictions on him. God is omniscient. He is all-knowing. He does not need us to speak, act, or think for him. Is he only a God nearby and not a God far away? (Jeremiah 23:23). How big is the God you worship? Is he bigger than your problems, your circumstances, your situation, your sickness, your friends, your family, or your issues? Who is the leader of your worship? Don’t mock God. Don’t think of him as a neighborhood god. He is not limited to just local neighborhoods. Take the limits off of him. Be on high alert every day. You may never know when He will come down your street in your neighborhood and pay you a visit. Be ready. Ask yourself these questions the next time you find yourself facing a hopeless or troubling situation. What corner will you be turning or what side of the street will you be on when God shows up to visit? Remind yourself who God is. He is omnipotent. He has all power. Put your trust in God. 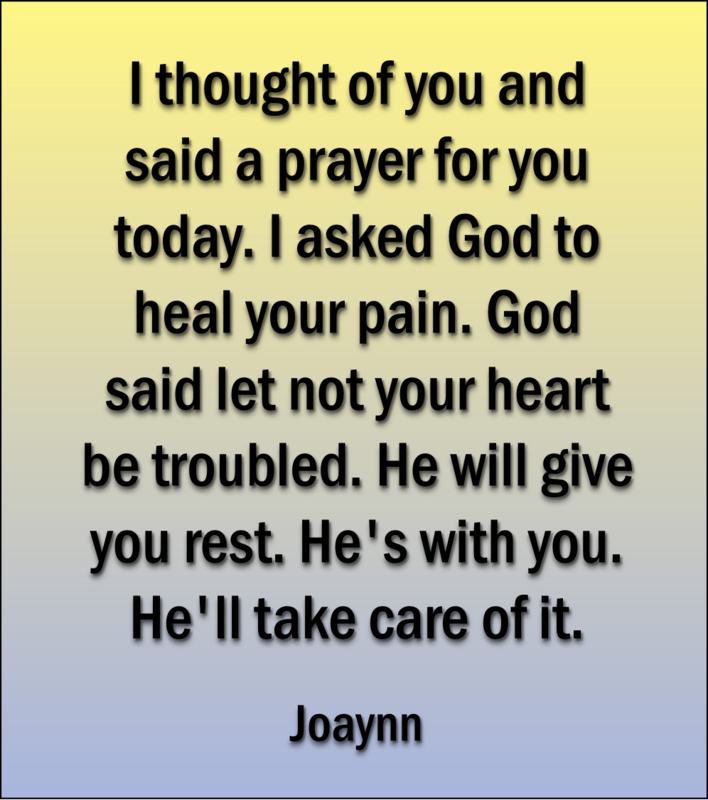 No matter the situation or any manner of sickness or disease or loss, know God is a healer. He will fix it. He is a heart fixer, mind regulator, and an ever-present help. Put everything in his hands. He will handle it. God Is A Just God. He Will Do Just As He Promised. No Matter The Circumstance Have Faith. The Enemy Has Already Been Defeated! Rain falls on the just and the unjust. None of us are exempt. Sometimes God uses trouble to lead us in the right direction. Trust Him. God is a just God. We are the righteousness of God. The enemy has already been defeated. Stand firm. 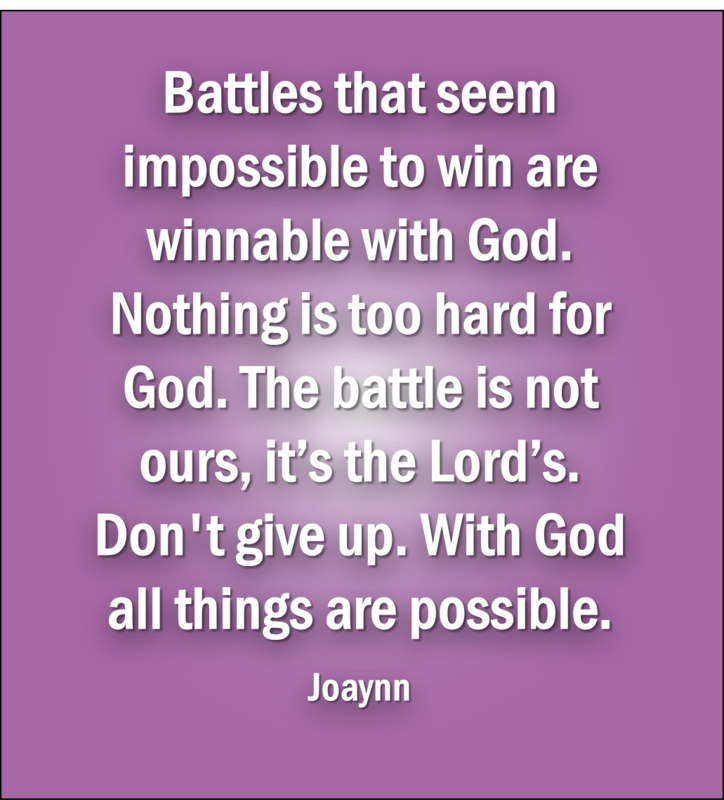 Nothing can defeat God’s purpose for us. There will be difficult times when nothing makes sense to us. It feels like God is distant. It is not for us to understand why things happen as they do but for us to trust God when we are going through. God hears the prayers of the righteous. He hears every prayer, sees every tear, and knows when our hearts are troubled. He is in the midst. He promises to make it all better. Life can weigh us down but Jesus tells us not to worry he will give us rest. God knows everything we are going through. Nothing is hidden from him. Cast all your cares upon the Lord and he will give you rest. Storms will come and rain will flow like a river but it will not last forever. God has not forgotten you. It’s not the end. God is the same today and yesterday and forever. God promises to never leave us or forsake us. You’re not alone. Whatever we go through, he will bring us through it. God will calm the storm. God will make the enemy pay for bringing the trouble. He will go before you and fight your battles. Push through the trials, tribulations, and pain. Don’t live life defeated. Trust Him. 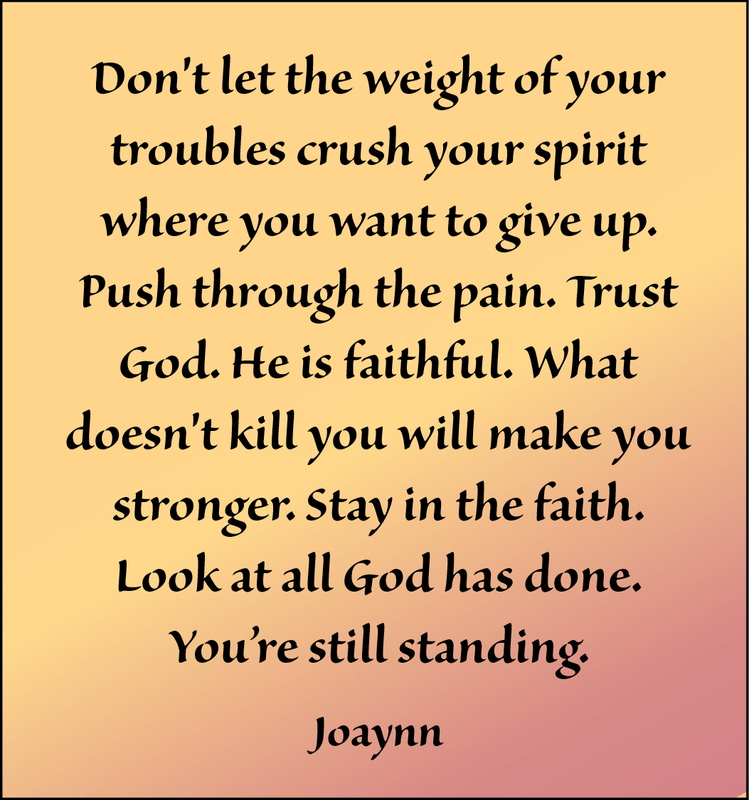 Don’t let the weight of your troubles crush your spirit where you want to give up. God is faithful. It’s not over until God says it is over. You may fall down. God will raise you up. What doesn’t kill you will make you stronger. Stay in the faith. You’re still standing. Matthew 5:43 – 45 “You have heard that it was said, ‘You shall love your neighbor and hate your enemy.’ 44 But I say to you, Love your enemies and pray for those who persecute you, 45 so that you may be sons of your Father who is in heaven. For he makes his sun rise on the evil and on the good, and sends rain on the just and on the unjust. When Jesus Said, “It Is Finished” It Is Done. Didn’t He Complete The Work God Gave Him To Do? Believe Him! Jesus says, “It is finished.” It is done. There’s no need to wait for something more to happen. No matter how hopeless the situation looks, believe him. Let His will be done. Let Him finish his work. 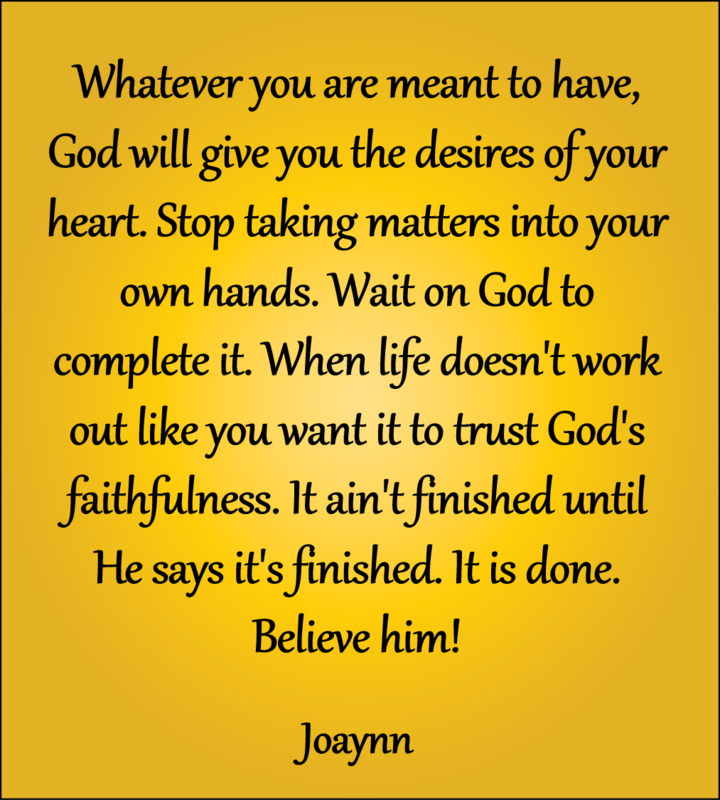 Stop taking matters into your own hands trying to finish what God started. Jesus came and finished what God sent him to earth to do. He completed the job God gave him to do. He didn’t take matters into his own hands. He followed God’s plan. He didn’t come to abolish the law. He came to fulfill the law. Too often when we try to figure things out on our own, we want what we want when we want it and will do whatever it takes to get what we want. We become impatient and want immediate results. It’s easy to convince ourselves we can do God’s job better than him. We’re in a hurry. “God is taking too long.” Slow down. Be patient. God is not man, that he should lie, or a son of man, that he should change his mind. Has he said, and will he not do it? Or has he spoken, and will he not fulfill it? (Numbers 23:19) He keeps his word. Believe him. Whatever you are meant to have, God will give you the desires of your heart. Wait on God to complete it. When life doesn’t work out like you want it to, trust God’s faithfulness. It ain’t finished until He says it’s finished. It is done. Believe him!